Kids Air Power Soccer Music Disc by THESIMPLE - Only $16.99 + FREE Shipping w/Prime! Check out this Kids Air Power Soccer Music Disc by THESIMPLE on Amazon for Only $16.99 + FREE Shipping w/Prime! Best toys for kids：it can play alone,also suitable for a few people to play together, so children will not compete for toys anymore. They can play with parents, brothers and sisters, and friends. INDOOR&OUTDOOR: You can turn any floor into an air hockey/soccer surface, perfectly at home on wood, linoleum, polished concrete, and even low-pile carpet. 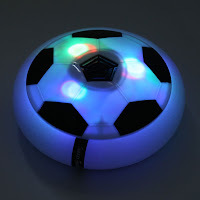 DURABLE LED SOCCER: You can kick it like a real soccer ball, not just a toy！It also has colored light on ball surface with button , making your night game wonderful. Must be powered by 4 “AA” batteries (NOT INCLUDED). 100% brand new and high quality Combine soccer and hovercrafts ,With Foam Bumper Protection, Its substantial, non-marking foam bumper that keeps it from damaging or marking up walls and furniture. Colorful lights: the led light soccer has colored light on ball surface, let the children's night more colorful and have a sweet dream. / UPDATE MUSIC VERSION:Open the button,it can not only air flow but play the music,more attractive and interesting than the old version. Perfect size: it's light and easy carry, the little child can play it indoor or take it to park, playground and school. 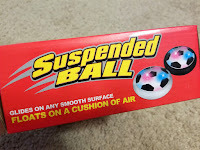 Soft & Safe Indoor Fun! 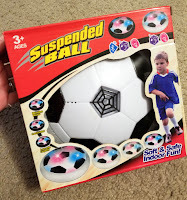 This Air power soccer is an amazing floating ball game that's great for both indoor or outdoor Powerful fans create a cushion of air turning any surface into an instant playing field. 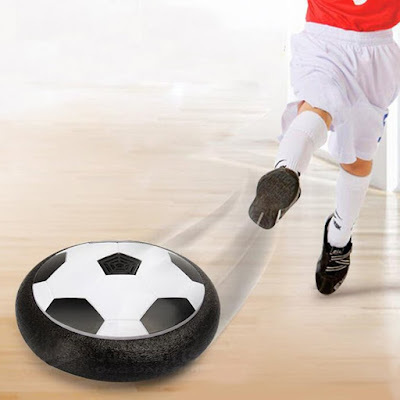 With its powerful hover action, the Air Power Soccer Disk literally floats on a cushion of air! The disk's outer rim safely protects furniture and walls while allowing great rebounding. Just switch it on, place it onto any smooth surface, and a simple kick propels the disc for fast sports action indoors or out! Colored LED lights make your game wonderful even in night. The air power soccer can draw children's attention well from tv and online games. Material: Friendly material ,non poisonous plastic. 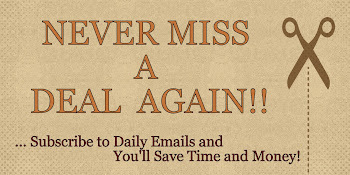 1.Screw down the bottom battery lid with a screwdriver. 2.Install 4 "AA" batteries on the bottom of the disk. 3.Turn on the switch and start playing.